Parents: Get FREE Diversity Children’s Book! 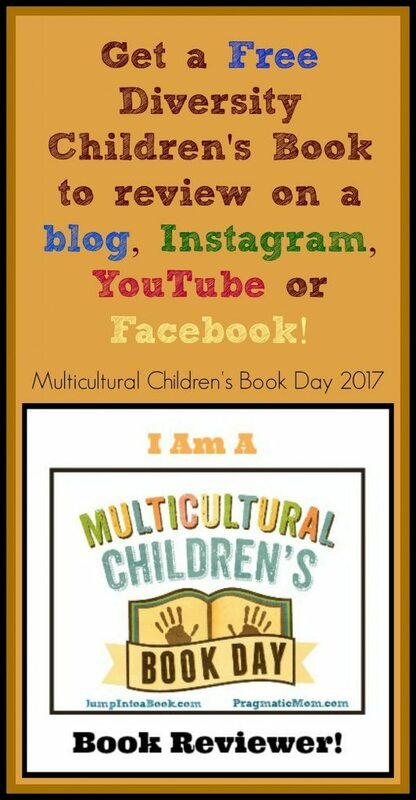 Are you interested in receiving a FREE multicultural children’s book to review for Multicultural Children’s Book Day 2017? Big News: You DON’T have to be a blogger this year!! That’s right! Get a FREE diversity children’s book and post your book review and optional book extension activity on Instagram, Facebook, or YouTube. Bloggers, welcome too, of course! We’re just expanding our outreach so that we can give away more FREE diversity books to parents! Choose the social media platform that you prefer: your blog, Facebook, Instagram, or YouTube! When signing up to be one of our book reviewers simply indicate which platform(s) you plan to post your review on in the “blog URL” space on the below Google sign up form that can be found HERE. Step One: Reviewers sign up via a Google Sign-up and review a multicultural children’s book for this event. If you will be posting your book review somewhere other than a blog, simply indicate which platform(s) you plan to post your review on in the “blog URL” space on the below Google sign up form: blog, Facebook, Instagram, or YouTube. Step Two: Reviewers are “matched” by the Multicultural Children’s Book Day team with an author or publisher who will mail you a free children’s book to review during the timeframe of November/December. Step Three: Once matched, an email will go out sharing who you are matched with. Please respond in a timely fashion with your mailing address. Authors and Publishers are responsible for getting reviewers their books so we want to give everyone plenty of time to receive and read their free book. Step Four: Reviewers are then encouraged to share their thoughts on the book (a basic book review) in the form of a complete and descriptive post on their chosen platform. Many Reviewers add a book extension activity to bring the story to life. Step Five: Once the book review post is live (any time between January 1 and January 27th is good), Reviewers are invited to “link up” their blog post on the Linky that will be found on any of our CoHosts’ sites and also the MCCBD website. This linky will go live on January 27th.. I had offered a book for this event. Will one be needed? Dear Pragmatic Mom – I was wondering if a retired school librarian could join this effort? I am a mom and a grand mom but I’m mainly a lover of children’s books that are multicultural. Do you think that would be appropriate? I’d love to review books. I was also an elementary school teacher and I think finding activities to go along with books is one of my favorite pursuits as a teacher. For example, I went to Japan for a month and wrote a beautiful curriculum for elementary school. I incorporated children’s books throughout. ABSOLUTELY!!! We’d love to have you! I should have used more inclusive language. I’m so sorry about that!!! yes, yes, yes! We would be honored to have you join us! Thank you! Hi Mia! It’s Tina from Amanda’s Books and More on Instagram. I left a message there last night about wanting to get involved. I checked out the steps and the sign-up form. I just want to know if I can participate since I’m in South Africa, before I go through all the steps for nothing. Also, if I can’t receive a book, I would still like to help promote this via my blog. We’d love to have you join us and we have some eBooks or pdfs that we can send you. Thank you so much for your support. Signed up! Don’t have an Instagram account. I’m low tech! Just post on your blog! We are opening it up to non-bloggers this year. They can chose either Facebook OR Instagram OR YouTube … hopefully this will increase the number of books we can send out! Already signed up! Looking forward to it! Thanks so much for your ongoing support Erik!!! All signed up Mia. Looking forward to all the great books to discover! Thanks so much for your continued support Bonnie! I love Multicultural Children’s Book Day! Thank you so much for co-hosting again this year! You have been there from the beginning and we are so grateful for your support! We are just about ready to announce the co-hosts. One of our co-hosts had a computer meltdown so we are waiting for her computer to come back to get her info for the post.